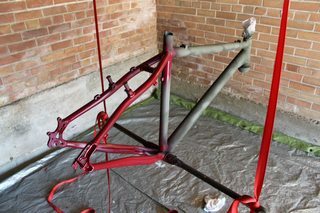 First coat of paint on the frame. Weapons of choice. I stuck to the same brand and tried to get professional grade when possible. 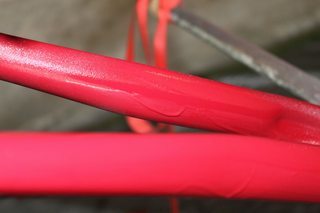 Imagine your newly painted bike frame. Imagine all the details and intricacies. Now open your eyes and forget about fulfilling half of those details! Seriously. Using sprays cans makes it very difficult to make clean and accurate detail painting. If you’re patient enough, I’m sure you could use a paint pen or brush and go to town.. but that’s not me. I wanted something good looking and unique. I didn’t have to go crazy on the details. That being said, if you are going to use multiple colors and stencils like I did, remember to think backwards. “What does that mean?” you ask? That means that you have to think in layers. If you have a top-most detail, that will need to be painted last. The color that underlines it will need to be painted first. As an example, to the right is my first run of of my maroon base coat. The other kind of runs. No bueno. Stick to the same brand for painting, including the clear sealant. There is no science that proves this, but I would imagine products engineered by the same company generally work best together. 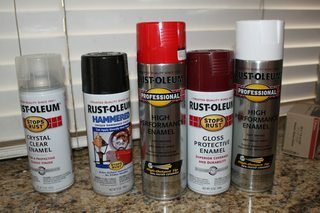 I used Rust-oleum for the whole project. Use several coats at each layer. At the end of the day, this bike will still have to be able to take a beating on the trail. Sketch out your design ahead of time. This will save you from getting in to the project then changing your mind mid-project. Then again, it may not.. but it helps to make you think out some of your ideas even if you can’t draw like Leonardo.. If you are going to make stencils, go to Michael’s or a craft store and get an exacto knife, a cutting mat and some adhesive stencil paper. In between coats of your first layers, you can work on drawing the stencils and cutting them out. Use frog tape for detailed lines. Use blue tape for surface area masking. SPRAY FROM 12 INCHES PLUS LIKE THE CAN SAYS. This was my first mistake. I thought I could safely get close than that to make the paint coating a little heavier. It simply ended up running the paint (look at the picture on the right) and I had to wet sand the paint down and re-apply a couple of coats. It takes less time to make multiple light passes. Most of the paints I worked with allowed you to apply a second coat 15-20 minutes after the first coat. Basically, what I’m saying is, light coats are cheap on time, running coats are expensive on time. 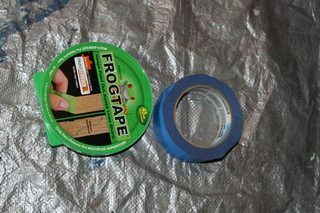 Use Frogtape for detailed paint lines. Avoid using the blue crap for detail lines on the frame. It’s okay to use for larger surface areas. I would also recommend in grabbing some used newspaper or packing paper. You’ll need it to wrap larger areas of the frame.